Content delivery networks (CDNs) serve up a large portion of internet content today. By leveraging geographically distributed data centers and edge servers, CDNs overcome latency issues and provide increased availability resulting in an improved viewer experience. When a user requests media, a copy of that media is cached locally on an edge server close to that user. This improves the experience for subsequent deliveries made to users in that same area. Moreover, data centers and edge servers are strategically placed to cater to a worldwide user base. These characteristics have made the use of CDNs almost ubiquitous in the Media & Entertainment industry. As the M&E industry evolves, users expect ever-improving experiences on their streaming devices. Here are two challenges that CDNs are currently working to overcome that will let them continue to provide improved services. ABR strategies have been around for quite some time; they enable minimal buffering and quicker start-times for users with a range of possible network bandwidth and device capabilities. To achieve this, multiple bit rate files of an asset are created and made available in streaming locations. ABR-aware players request the appropriate bit rate based on the network bandwidth conditions and ideally, with an awareness of the users device. Since B2C applications generally have a large number of users accessing the media, such issues are faced only by the first few users. Hence the experience of almost 99% of users is above par, at the cost of a decreased experience for the first few users. With B2B applications, the issues introduced by the CDN could be more pronounced since the number of users accessing each specific media content is generally smaller, and the fraction of the users that are in the early user category may be correspondingly larger. While some CDN providers have provided a solution for this by providing APIs to pre-fetch content, there is no guaranteed SLA for content replication and no clear details on content retention policy at the edge sites. Hence, such solutions may not be practical. What’s needed is a mechanism by which the entire HLS package is downloaded from the origin to the edge servers, as soon as the first media request arrives. The above diagram shows that the bit rate is selected based on the user’s bandwidth. Even though the high bit rate version is available in the CDN edge location, the low bit rate request needs to go to the Origin server to be fetched and provided to the low bandwidth user. These security elements focus on user-specific details to provide stronger deterrence and to ensure precise traceability in case of violations. This also means that the security elements have to be freshly applied whenever a specific user requests an asset. Unfortunately, because each request requires a new security application and download, this means that the content stored on the edge server cannot be leveraged to provide media quickly. The picture above illustrates that for every user request the content at the origin is freshly watermarked and encrypted with user-specific information. The cached content at the edge servers is not usable again, thus contributing to increased latency. 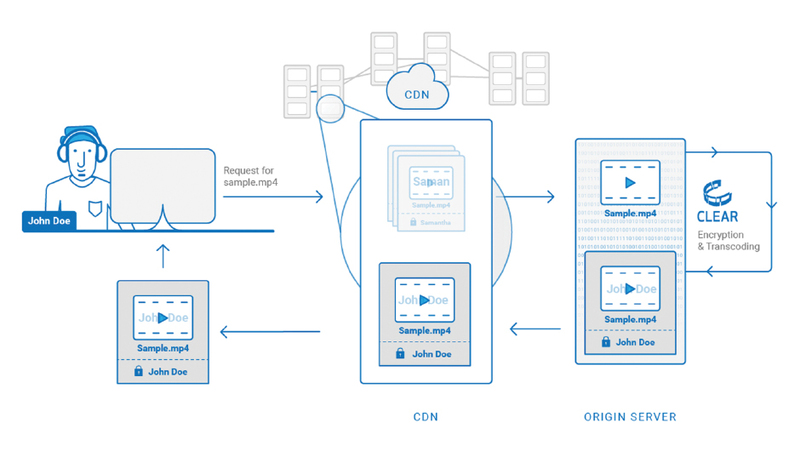 In the diagram above user John requests sample.mp4 file. This file had already been requested by another user before, and the file is available in the CDN. However, John’s request is a new, unique request and must be sent to the origin server for user specific water-marking and encryption. The challenges posed by content security and adaptive bit rate streaming are complex and directly affect end user media delivery experiences. Clearly, conventional CDNs need to continue to evolve and address these challenges for the specific needs of B2B applications. While CDNs may use edge processing to address these challenges, features like instream watermarking and forensic watermarking require integrations with vendor software, making edge processing very complex from a software integration and test perspective. Established CDN providers, or specific niche players, will need to take the lead in this space to provide a workable solution for B2B applications. While this happens, custom solutions will keep springing up to address the unique challenges that interfere most severely with the over-all user experience.